I’ve been in America recently and it was easy to observe that it’s not only Australians getting bigger around the waistline. With so many ‘weight loss’ regimes around and the dangers about obesity so clear, why are we just not shedding the pounds? It’s time to get some fact straight about weight loss and weight gain. It’s a long story but I’ll keep it short. Lie 1: Calories in and calories out have nothing to do with each other. It has been an easy assumption to make, one that even I and thousands of other fitness and health professionals have made in the past. As a result of the ‘eat less, move more’ message we have seen many people try to drastically reduce their calorie intake to levels where they are starving and miserable and the real consequences of this has been a REDUCTION in the calories out. Yes, that’s right…if you reduce your calorie intake your body will adjust and reduce its calorie expenditure. This explains why so many people struggle to keep the weight off even once they have had some weight loss success. Lie 2: All calories are the same. By listening to this message too many people are reading the calorie quantities on the side of food packets rather than worrying about WHAT they are eating. Here’s a question for you: Do you think the calories you consume through olive oil create the same reactions in your body as the equivalent calories from sugar? Sugar spikes your blood glucose levels and creates a chain reaction of other responses that are not so good for you (hint: disease causing reactions), while olive oil is absorbed by the small intestine and transported to the liver and so there is no significant increase in blood glucose. The point is that the body reacts differently to different types of food so why are we so obsessed with calorie counting? (Plus, it bores me to tears). Lie 3: Weight gain occurs only because we don’t move enough and we eat too much. 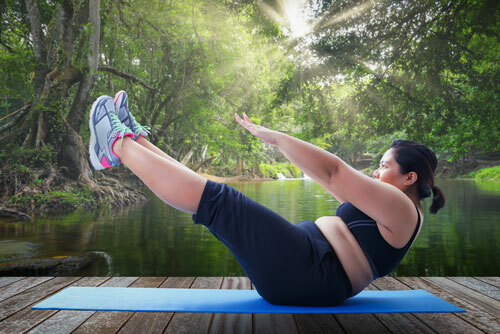 The truth is that weight gain and weight loss is much more complicated than our ‘eat less, move more’ message of the past (and that some people are still trying to push). How much and when we eat is largely controlled by hormones. One of the biggest problems here is that our hormonal balances are often stuffed up by any one of many factors such as consuming processed foods filled with chemicals and processed oils. We are finding out more and more about chemicals in our environment that also trigger changes in our hormonal balances, not to mention that there seems to be a genetic link because we know that obese parents are much more likely to grow obese kids, and it’s not always lifestyle that is the major cause. Ditch the calorie counting and focus on WHAT you are eating. Ditch the processed garbage and fill your body with nutritious foods. Read food labels. If you don’t know the ingredients it’s likely to be filled with chemicals and things that are stuffing up your hormonal balances and causing weight gain and other problems (headaches, skin problems and more). Get active by taking up a realistic exercise program that you can do most days of the week. You don’t need to be Olympic fit for health. A 30-45 minute daily workout plus lots of incidental movement during the day (take the stairs, not the lift) is associated with a longer, healthier life. The exercise part will be mostly about health, i.e. building stronger bones, increasing muscle tone so that you have an improved metabolic rate and getting a healthier heart. Now, to do all that you need to fuel your body with great food, don’t you? Rose is a Fit Busy Mum of 3 fit kids. She aims to empower mums who are time poor. She acknowledges that mums are ‘busy’ but tries to inspire them to regain their fitness through simple everyday habits that she promotes through her book ‘The Fit Busy Mum: Seven habits for success’.